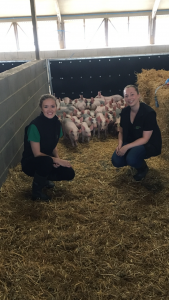 Primary Diets, the specialist starter diet business within AB Agri group of companies, has made two new appointments to strengthen its technical support and product development offer to pig producers both in the UK and globally. Dr Sadie Douglas joins the Primary Diets technical team as a nutritionist. Dr Douglas took a PhD on the management and nutrition of light weight pigs at Newcastle University. She subsequently moved to Farmex, the intensive livestock systems business, where she oversaw the real-time monitoring of pig farms. Primary Diets says the knowledge she gained during this time will be an asset to its business. At the same time, Melanie Stokes joins the company after completing her BSc (Hons) Bioveterinary Science course at Harper Adams University. Ms Stokes completed an industrial placement year with Primary Diets in 2017. “Her enthusiasm for piglet nutrition gained her a full-time job offer as she returned to university to complete her studies and she now supports the technical team as a junior nutritionist,” says the company.